I have previously uploaded some NetLogo tutorials, and for the next one I thought I would revisit the famous “Artificial Anasazi” model of Axtell et al. (2002). This model was ported to NetLogo by Marco Janssen in 2008 (see his 2009 JASSS paper and his model). I have rewritten the model from scratch for explanatory purposes (though very much inspired by Janssen’s work). It makes a good example of how NetLogo can assist land-use studies, both archaeological and present-day. Much has been preserved by the dry Arizona climate. Fragments of pottery (like the bowl at the top of the page) are found routinely, and these well-preserved ruined Anasazi dwellings below are not far away. Extensive archaeological investigation has told us both the climate that existed between 800 and 1350 AD, and the population of the valley during that time. For purposes of simplicity, my version of the model does not include the availability of drinking water and the locations of dwellings. I am only modelling the location of farms. Consequently, although I hope to accurately model population numbers, I do not hope to accurately model the locations at which people lived, as Axtell et al. did. In addition, this first half of the tutorial will only look at code for the patches in the model. The model requires three data files in a folder called “adata” (zipped version here). 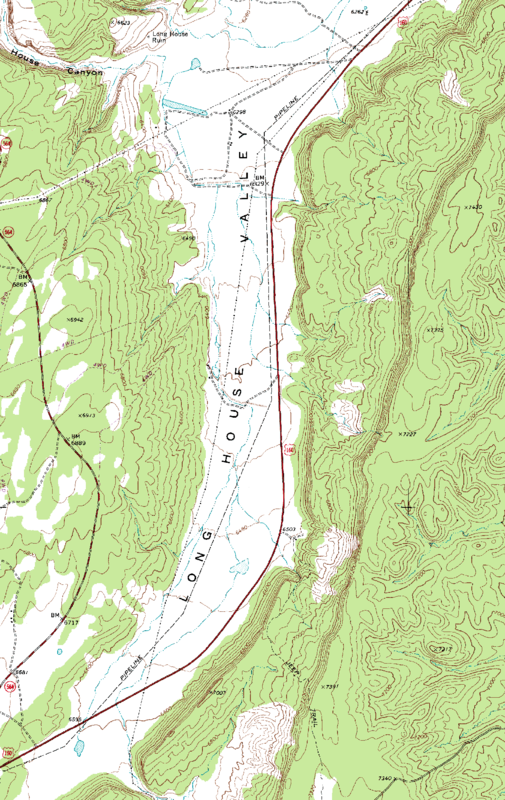 One of these is a map of the valley, formatted as an ascii GIS raster file, which can be read by the NetLogo GIS extension. Such use of GIS datasets is common in land-use models. The following command will read in the raster file, and set a numerical value attribute of each patch. 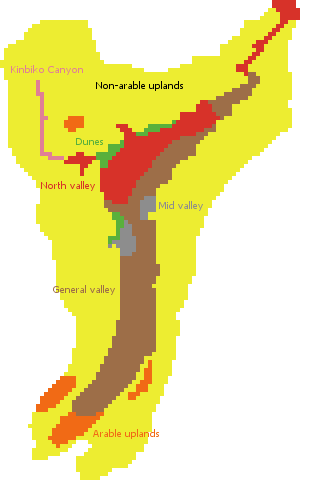 The colour-coding is important, because different parts of the valley have had different fertility levels over time. Fortunately, we have a good idea what those levels were. 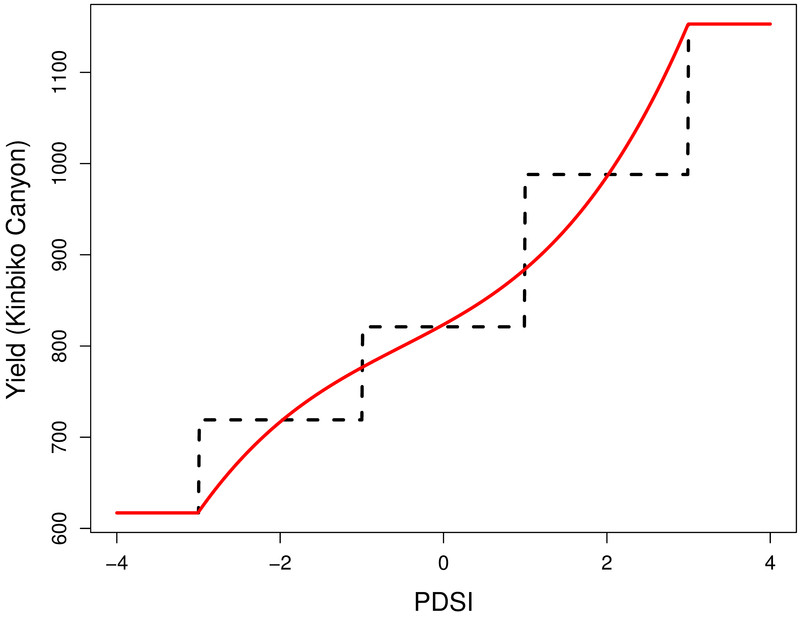 One of the data files contains estimates of the Palmer Drought Severity Index (PDSI) for each patch, over the 800–1350 period of the simulation. This file is formatted as a sequence of lists, one for each different zone of the valley, with the first element of each list being the zone name, and the rest of the list being PDSI numbers (it’s handy that NetLogo can read in an entire list in one gulp). The following code transforms the data file into a table called pdsi-table (obviously this also requires the NetLogo “table” extension). 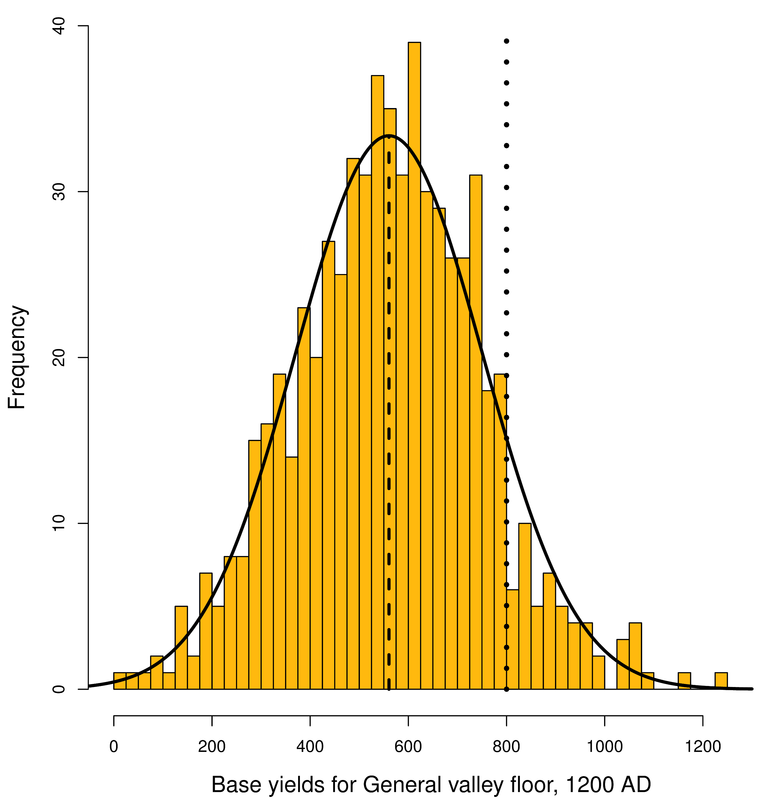 Because the normal distribution (the “bell curve”) has infinitely long tails, the calls to random-normal can sometimes return negative or very large crop yield values. Excessively large values have little effect on the simulation, because the model incorporates a rule that stored corn more than two years old goes bad and is thrown away. However, negative values must be explicitly tested for (negative crop yields are likely to give some rather strange behaviour!). The effect of the harvest-adjustment is thus to restrict the population of the General valley floor to 53 good farms (8.3% of the patches), but also to impose a rather unrealistic triangular crop-yield distribution on the patches being farmed (i.e. the right-hand tail of the “bell curve”). It seems to me better to explicitly provide a usable-farm-fraction slider that restricts farming to a subset of patches. This permits a more realistic harvest-adjustment of 0.9, corresponding to “wastage” of only 10% of the crop. It turns out that 0.21 is a good value for usable-farm-fraction. But why would 79% of the patches be unavailable for farming? 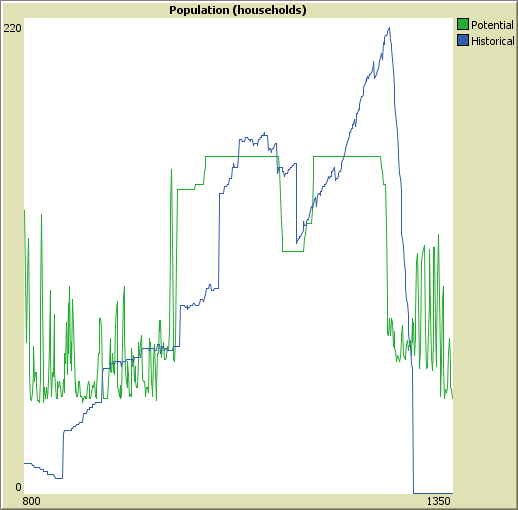 One reason is the factors I have excluded in this tutorial version of the model – water supply and housing. Some potential farms are just too far away from suitable housing sites. The Anasazi penchant for cliff dwellings also suggests that potential housing sites had to be defensible, and this also rules out some potential farms as being too far away from suitable housing. Additionally, some patches would be ruled out by various terrain factors, and there would also be social pressures that limited the population level. Furthermore, the patches in the model are a little less than a hectare in size, and so one-hectare farms will occupy a little more than one patch. The usable-farm-fraction slider compensates for all of these effects. We call this initialisation in setup, and we update the historical-base-yield list in the calculate-patch-yields procedure. We can also average the list to smooth out temporal variation in crop yields, compensating for the corn-storage ability of the Anasazi. The code count patches with [ mean historical-base-yield >= 800 ] will count feasible farms, taking corn storage into account. Plotting (see graph below) shows a good fit between predicted carrying capacity of the valley and actual population levels. Even better results are obtained when actual households are modelled, as we will see in part 2 of this tutorial. The keys to defining this NetLogo model, so far, have been loading of a GIS map and various archaeologically established datasets, together number-crunching to calculate crop yields. When households are modelled, however, some code for human decision-making will also be needed. The model also illustrates how much functionality can be achieved with even a small NetLogo program! See part 2 of this tutorial for the human side of the model. The full NetLogo program is at Modeling Commons. This entry was posted in Tutorials and tagged Anasazi, Archaeology, Arizona, GIS, NetLogo, Simulation, Tutorials by Tony. Bookmark the permalink. Interesting stuff. the succinct netlogo code is just amusing: it makes the job seem easier. how familiar are you with other tools like anylogic? I am thinking of buying the pro version. Whats your experience with System Dynamics and Discrete Events models? NetLogo certainly allows very succinct code, which makes to easier to discuss a model like this in tutorial mode. As you seem to be hinting, however, the sweet syntactic sugar doesn’t take away the fact that actual programming is still required. However, the programmer does get a lot of help from simulation-specific NetLogo primitives, and succinctness (as long as it isn’t taken too far) does allow the programmer to concentrate on what needs to be done, rather than on how to do it. I’m sure you could do build a similar model in AnyLogic, although I suspect the AnyLogic code would be less succinct. Indeed, I would be interested in some side-by-side comparisons of NetLogo, AnyLogic, and similar tools. The main competitor to NetLogo is probably Repast, but NetLogo is, in my view, much easier to build models in. As to System Dynamics models, the tasks I’m interested in suit an agent-based approach much better – although there is actually a System Dynamics modelling component in NetLogo. Some tasks will certainly be better served with a large-scale Discrete Event model – but even then prototyping in NetLogo may be useful.